A short spray leaves the air fresh, clean and hygienic. 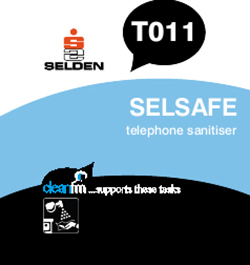 Use to cleans and sanitise telephones. Telephones: Spray onto a lint free cloth or paper towel and wipe over telephone equipment. Air freshener: Sanitise and freshen the air with short sprays into room corners. Do not spray onto fabrics or furnishings. Composition Triclosan and perfume carried in an alcohol base.